Here we are beginning the last month of the year... first thing we'll know, Christmas will be at our door! For this 60th challenge, Christina and I, along with our team mates, decided upon a Christmas card theme. 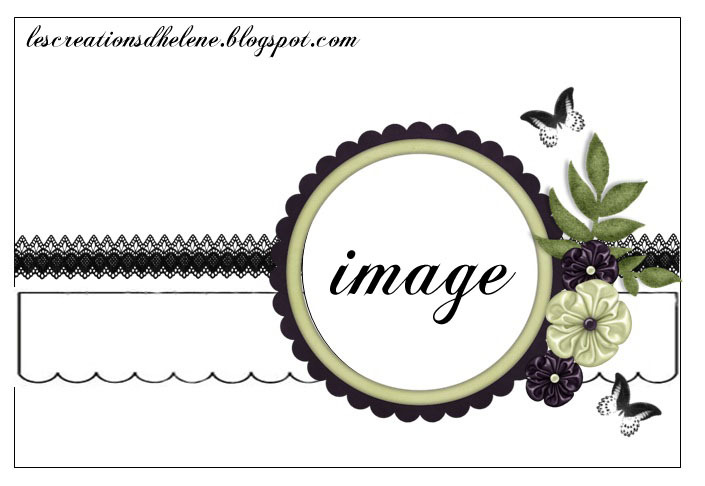 It was also time for me to submit my DT projects for Scrapbook ta vie, and because the week just went sooo fast, I will present you the card I created with Hélène's sketch. Déjà le début de décembre, le dernier mois de l'année... première chose que l'on saura, on se retrouvera le matin de Noël. Justement, afin d'être prêtes, Christina, nos coéquipières et moi nous sommes données le défi d'une carte de Noel. Elle tombait à point, j'ai manqué de temps, et j'ai décidé de jumeler un de mes projets de Dt avec ce défi. Je vous présente la carte réalisée avec le sketch d'Hélène, et vous invite à participer à notre concours en grand nombre. 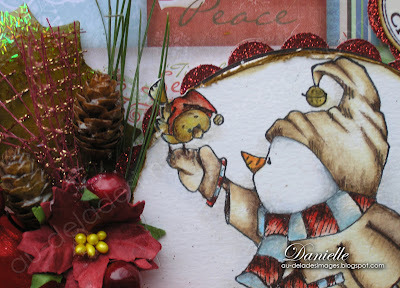 I feel in love with this Whipper Snapper snow man as soon as I set eyes on it when I visited Scrapbook ta vie just lately. It is stamped on Bristol vellum paper, and colored with prismacolor, and taltine. (gamsol). 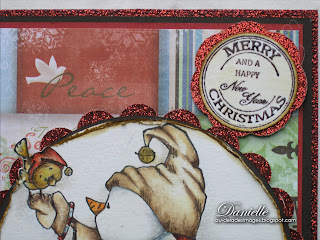 I used the wonderful papers from BoBunny, Blitzen Collection, also available at the boutique. I added real pine cones in my bouquet, I simply coated them with glossy Mod Pudge, and puncture a little whole in them to insert a needle. Notice the cute red mesh, with which I made the cute bow inside the card. Behind, you can see a glimpse of a very glittery leaf, on which I used distress inks to color, and a few coats of Glaz On, to which I added glitter. Glaz on glues very well and adds a nice litttle vintagy look that I really love. Dès que j,ai vu cette étampe Whipper Snapper, je n'ai pu résister. J'adore les bonhomme de neige, et celui-ci avec son petit ami oiseau est tout à fait adorable. Il est étampé sur bristol, et coloré aux prismacolor. J,ai utilisé les merverilleux papiers BoBunny, blitzen Collection, qui sont disponible chez Scapbook ta vie. Mon bouquet est composé de cocotte et d'épine de pin cueillis dans le parc longeant la piste près du fleuve où je marche à chaque jour. J,ai ajouté un filet doré et rouge que j'ai déniché à la boutique, faites vite, ils s'envolent rapidement. Enfin, la grosse feuille de houx est encrée à la distress, j'y ai ajouté du Glaz On vintage, et collé des brillants dessus, quel effet. La photo ne rend vraiment pas justice. Instead of a little pocket, this time I simply used twine to serve as a holder for a gift card. J'ai innové... des petites cordes soutenues par une petite boucle à laquelle se balance un petit pere Noël au lieu, de mon habituelle petite pochette pour y mettre un certificat cadeau de votre boutique préférée, ou des sous tout simplemement. I stamped a little reindeer on the writing card, and inked the borders with Vintage photo, distress ink. Un espace d'écriture orné par un petit renne, dont les bordures sont encrées avec la Distress vintage photo. On the cute little round sentiment, I used GLAZ ON, that gives a nice transparent vintage finish. Un gros plan du sentiment, sur lequel j'ai ajouté une couche de Glaz on, transparent et couleur bronze, une note antique en contraste avec les brillants. This is it for me today, please take a moment to visit my friends and team-mate on their respective blogs to discover the magnificient creations. Enjoy! I will be back later this week with another Christmas card, as soon as I sit down, and complete the inside! 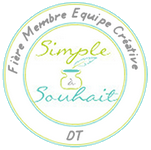 C'est tout pour moi aujourd'hui, prenez un moment pour visiter mes amies sur leur blogue, et découvrir leurs merveilleuses créations. Amusez vous, inspirez vous. Je vous reviens un peu plus tard dans la semaine avec les détails de mon autre carte DT que vous pouvez présentement voir sur le site de Scrapbook ta vie. Comme je t'ai déjà dit Danielle elle est vraiment magnifique ta carte!!! J'aimerais avoir ton talent pour faire des belle carte comme ça!!! Good Morning Danielle! Gee where do I start??? SIMPLY AMAZING!! You are one very talented and brilliant artist!! WOW this card has so much detail and beautiful color to admire!! Great use with the twine and WOW again those stamps are all WONDERFUL!! GORGEOUS! GORGEOUS! GOEGEOUS!!! Hey I think I absolutly love this card! Good morning, Hon! OMG...how festive! I adore this wonderful snowman, colored magnificently ...sooo sweet!!!!!! The inside is just as beautiful as the outside. 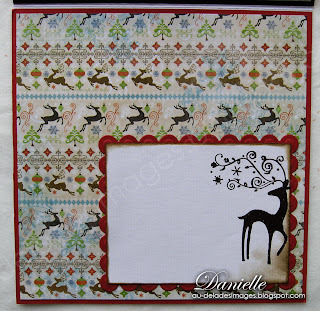 I love the addition of the reindeer on the jotting panel. The papers are truly stunning and let's not forget that gorgeous cluster.....WOW!!!! Beautiful bow, along with all the other fabulous details. Stunning work, as always! Wow! quelle belle colorisation...extra! extra!! Et le petit bouquet de Noël, des plus charmants! Tu innoves....et ça donne du punch!! J'adoooore!! Toutes mes félicitations Danielle, tu es toujours inspirante. That settles it - I have just got to come live in your neck of the woods for a while - I love winter and cold weather. I want to tap into your creative brain. You come up with some of the most magnificent ideas and execute them beautifully! In fact, when I first looked at your blog, I though I was seeing 3 separate cards! That snow man is adorable and I HAVE to have him. So as soon as I have complimented you on this outstanding card, I am off to buy that stamp!!! Your card is awesome Danielle and I love what you did inside. Amazing! Oh my...this little scene is just precious! What a fabulous image...so sweet! Hello Dear Danielle! You have coloured this snowman SOOOooOOoO beautifully .. words cannot decribe! I love the colors and that fabulous lush bow with the prettiest of papers! GORGEOUS GORGEOUS GORGEOUS~!!! 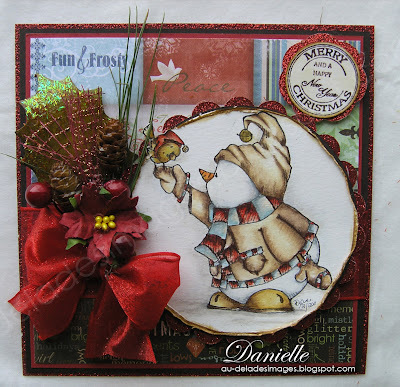 Hi Danielle, Your card is so darling!! I love the snowman image and you have colored it so beautifully!! I also love the floral arrangement with the pincones!! Have a wonderful weekend!! 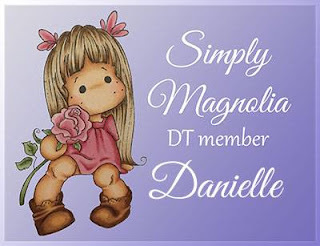 So gorgeous Danielle, love the scene you created, beautiful colouring, and gorgeous details...so very pretty. Oh sweetie!!! What in the world can I say? I'm speechless!!! this is one STUNNING card!!! Your coloring is flawless and out of this world!!! Love the colors, the papers, the design, EVERYTHING!!!! FANTASTIC card!!!!! So very sweet! Beautiful card inside and out! Ta carte est magnifique! j'adore tous les détails et ta coloration est parfaite! bravo pour cette superbe carte! Merci de ton passage sur mon blog et pour tes bons mots. merci! Oh, Dani! This card is just spectacular! You are so talented, your coloring on this sweet image is perfection and I love, love, love your floral bouquet! This is absolutely stunning my friend! Such a pleasure to visit each week and see how far you've progressed over the past few years. Your work is always fresh and beautifully executed! This is absolutely GORGEOUS Danielle! The snowman is adorable and coloured beautifully. Love all the pretty details ... wonderful flower and ribbon. On Danielle, what a stunning card, your design is wonderful, I love the colours with the beautiful details....... the snowman is adorable and beautifully coloured. Oh, your cards are always so merry and cheerful and there's such a beautiful coordination between all the elements! 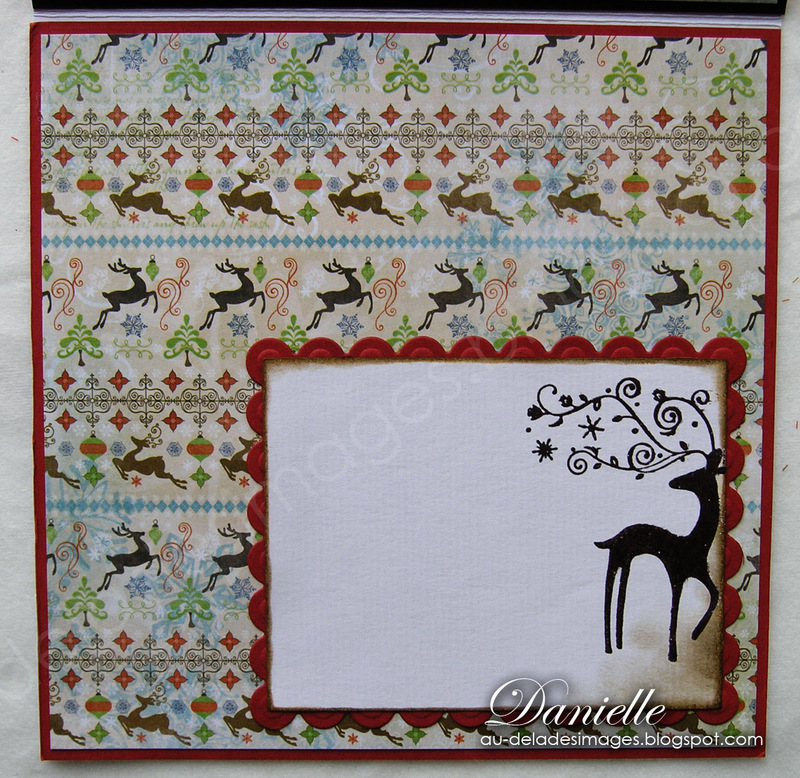 Love the reindeer papers and the embellies are so festive! Perfect Christmas card, love this!